That's me tending the Neuston net as it's being towed aside the R/V Walton Smith. 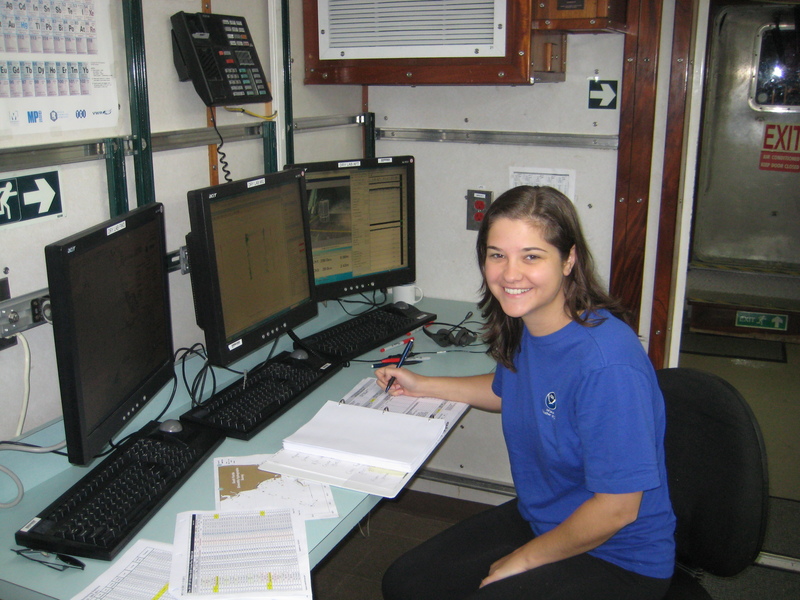 One of the many experiments we are doing on board is to learn about a plant that grows in the ocean called Sargassum. This tan plant floats near the surface and along in the current. It grows throughout the world’s topical seas. It can grow into large mats the and can be as large as boats and ships. Sargassum provides an environment for distinctive and plants and animals that are not found other places. These ecosystem rafts harbor many different organisms. On the third stop of the CTD cycle we drag a Neuston net along side of the boat. 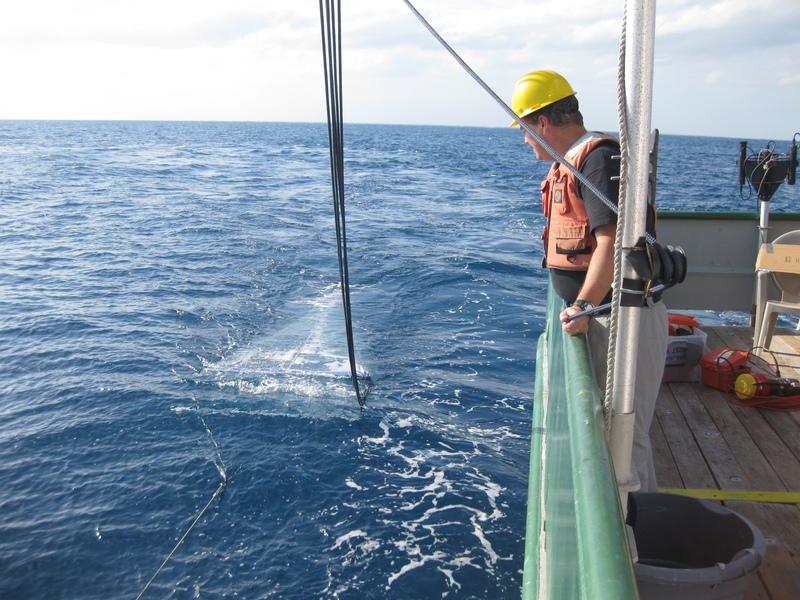 For 1/2 hour, night or day, the boat takes a slow turn as we drag the net along the surface as we collect samples. Almost all of the animals below are what we have found in the Neuston net. We’ll haul in the net and remove the contents. We’ll first try to get all of the animals out. The animals usually don’t survive but every once in a while we can save them (see below for some of the animals we captured with the net). We’ll next sort the plant life that we collect in the net. Of course we are looking for Sargassum, so we will separate out all of the sargassum. So, how do you measure what you get? We measure it by volume much like our mom’s measure shortening for cookies. We will fill up a graduated cylinder part way with water, put the samples from the net into the cylinder and then measure how much water they displace. For example, if we put 2500 ml of water in the graduated cylinder, then put Sargassum in the cylinder, the water level now measures 5500 ml . We then know that there are 3000 ml (5500 ml – 2500 ml = 3000 ml) of Sargassum by volume measure. Everything we collect from the net, we measure and record. Flying Fish— Yes, believe it or not, there are fish that fly. Last night as were preparing to lower the CTD, I noticed silvery-blue streaks in the water. One of the scientists with me explained that they are Flying Fish (Exocoetidae) and the lights of our vessel attracts them and many other types of fish to the surface at night. As soon as she explained this, one of them shot out of the water and glided about a meter and ducked back into the water. Read more about Flying Fish here. This fish was found as we unloaded the Moch net. Rock Fish — Each time we drag the Moch Net for the Sargassum survey, we can expect interesting things. Last night we captured a type of Rock Fish. Spotted Eel — We also found an eel that has white spots. I tried my best to see if I could more specifically identify it. We have saved it in an aquarium on board the R/V Walton Smith. Help identify this mystery fish. Make a comment below if you think you know what it is. Mystery Fish — This fish has many of us stumped. 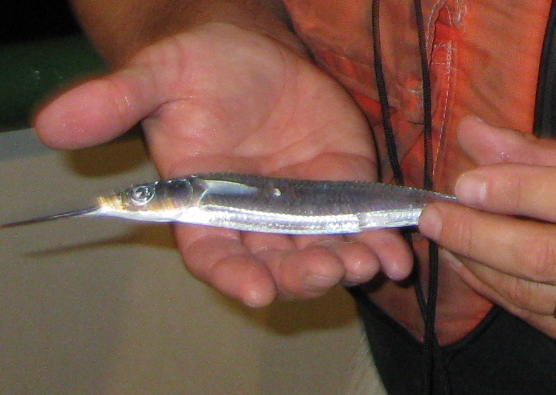 It has a long nose but when the fish opens its mouth, you can see that the pointy part is connected to its lower jaw. Put your investigative skills to use and help me identify the fish. Post a comment if you think you know what it is. For an enlarged view, click here. Moon Jellies — Many people call them Jelly Fish but actually they don’t belong to the fish family at all. They don’t even have a backbone. When we carefully picked these animals up, with gloves on of course, it feels like picking up Jello with your hands; it just slips through your fingers. You can find more about Moon Jellies, Aurelia aurita, at the Monterey Bay Aquarium. You can also find general information about Jellyfish at National Geographic Kids. 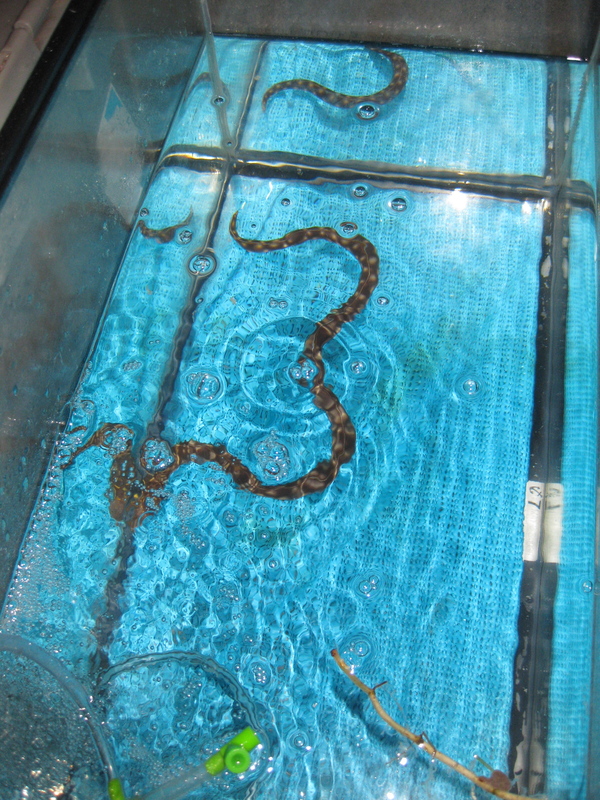 This eel was found when we were collecting Sargassum. Sharptail eel — It’s about half a meter in length and squirms all over. The scientist studying the Sargassum, has saved it in an aquarium so we can observe it. Its scientific name is Myrichthys breviceps. Honey Bee — Believe it or not a honey bee joined us. There was no land in view and a honey bee landed on me. The wind must have blown the bee to sea and it was probably very happy to find a place to land that was not wet. Porpoise — We also call these dolphins. Sometimes a pod of porpoises will get curious and investigate our boat. They will circle us, swim along side and even ride our bow wave. Sound and electromagnetic waves travel in a straight line from their source and are reflected when they contact an object they cannot pass through. Frequency is defined as the number of waves that pass a given point per second (or another set period of time). The faster the wave travels, the greater the number of waves that go past a point in that time. Waves with a high frequency are moving faster than those with a low frequency. Those waves travel out in a straight line until they contact an object of a density that causes them to reflect back. The speed with which the waves return, along with the wavelength they were sent at, gives a ‘shadow’ of how dense the object is that reflected the wave, and gives an indication of the distance that object is from the wave source (echo sounder). As jellyfish, zooplankton and other organisms are brought up either with the bongo net or the trawl net, examinations of the acoustic readings are done to begin to match the readings with organisms in the area at the time of the readings. On the first leg of the survey, there were acoustic patterns that appeared to match conditions that are known to be favorable to jellyfish. Turtle researchers have, for years, observed certain characteristics of stretches of ocean water that have been associated with sea nettle, ocean sunfish and leatherbacks. Now, by combining acoustic readings, salinity, temperature and chlorophyll measurements, scientists can determine what the exact oceanographic features are that make up ‘turtle water’. Computer images of acoustic scattering at night. 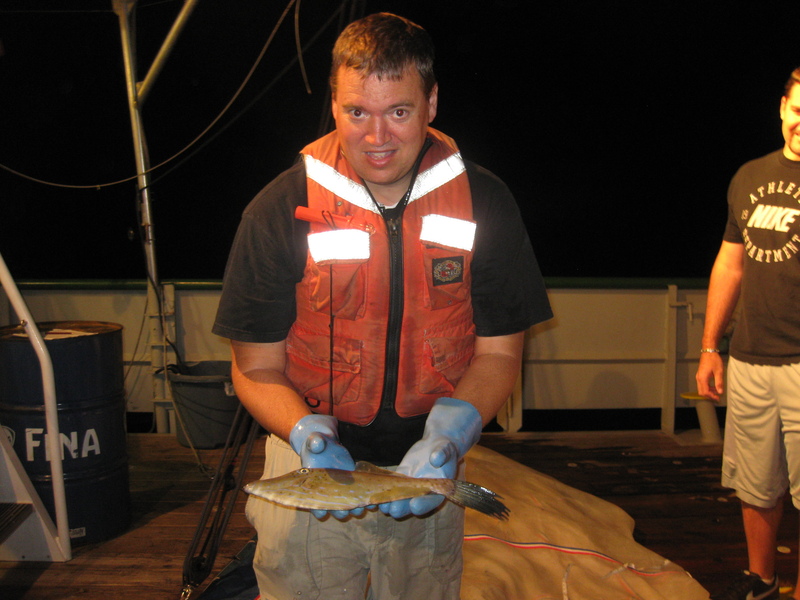 Acoustic data, consisting of the returns of pulses of sound from targets in the water column, is now used routinely to determine fish distribution and abundance, for commercial fishing and scientific research. 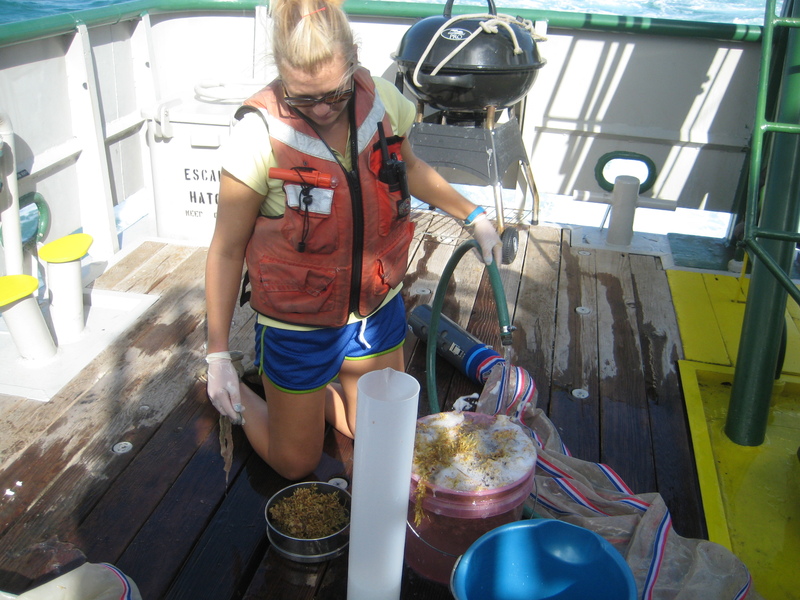 This type of data has begun to be used to quantify the biomass and distribution of zooplankton and micronekton. Sound waves are continuously emitted from the ship down to the ocean floor. Four frequencies of waves are transmitted from the echo-sounder. The data is retrieved and converted into computerized images. Both photo 1 and photo 2 give the acoustic readings. The “Y” axis is depth down to different depths, depending on the location. 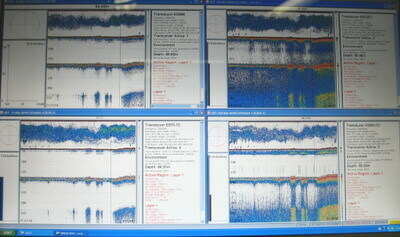 The frequencies shown are as follows for the four charts on the computer screen; top left is 38kHz, bottom left is 70 kHz, top right is 120kHz and bottom right is 200 kHz. In general the higher frequencies will pick up the smallest particles (organisms) while the lowest reflect off the largest objects. Photo 1 shows a deep-water set of images, with small organisms near the surface. This matches the fact that zooplankton rise close to the surface at night. Photo 2 gives a daylight reading. 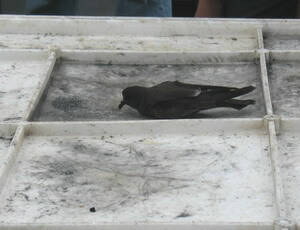 A Leach’s storm petrel rests on the trawl net container. It is more difficult to interpret. The upper one-fourth is the acoustic reading and the first distinct horizontal line from the top represents the ocean floor. Images below that line are the result of the waves bouncing back and forth, giving a shadow reading. But the team here was very excited: for this set of images shows an abundance of organisms very near the surface. 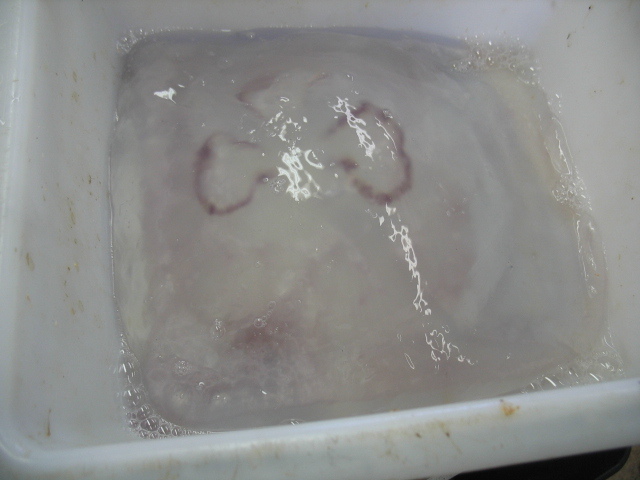 And the trawl that was deployed at that time resulted in lots and lots of jellyfish. They matched. Periodically, as the acoustic data is collected, samples are also collected at various depths to ‘ground truth’ the readings. This also allows the scientists to refine their interpretations of the measurements. The technology now can give estimates of size, movement and acoustic properties of individual planktonic organisms, along with those of fish and marine mammals. Acoustic data is used to map the distribution of jellyfish and estimate the abundance in this region. By examining many acoustic readings and jellyfish netted, the scientists will be able to identify the acoustic pattern from jellyfish. Karin releases a petrel from nets he flew into. The sensor for the acoustic equipment is mounted into the hull, with readings taken continually. Background noise from the ship must be accounted for, along with other types of background noise. 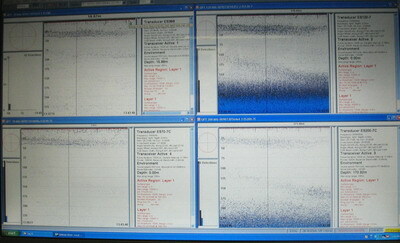 Some events observed on board, such as a school of dolphins being sighted, can be correlated (matched) to acoustic readings aboard the ship. Since it is assumed that only a portion of the dolphins in a pod are actually sighted, with the remaining under the surface, the acoustic correlation gives an indication of population size in the pod. The goal of continued acoustic analysis is to be able to monitor long term changes in zooplankton or micronekton biomass. This monitoring can then lead to understanding the migration, feeding strategies and monitor changes in populations of marine species. A Wilson’s warbler rests on the flying deck. Several small birds have stopped in over the week, taking refuge on the Jordan. Many bird species make long migrations, often at high altitude, along the Pacific flyway. Some will die of exhaustion along the way, or starvation, and some get blown off their original course. Most ships out at sea appear to be an island, a refuge for tired birds to land on. They may stay for a day, a week, or longer. Their preferred food source may not be available however, and some do not survive on board. Some die because they are just too tired, or perhaps ill, or for unknown reasons. We have had a few birds, and some have disappeared after two days. We hope they took off to finish their trip. Since we were in site of land all day today, it could be the dark junco headed to shore. ‘Our’ common redpoll did not survive, so he was ‘buried at sea’, with a little ceremony. About half an hour ago, a stormy petrel came aboard. 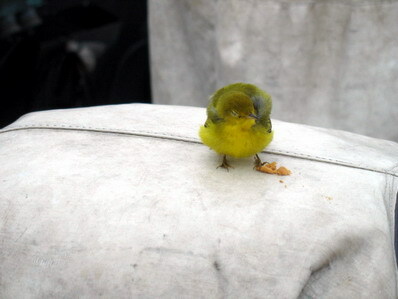 He did not seem well, but after a bit of rest, we watched him take off. We wish him well. Acoustic data: sound waves (sonar) of certain frequencies that are sent out and bounce off objects, with the speed of return an indication of the objects distance from the origin; Echo sounder: device that emits sonar or acoustic waves Dense or density: how highly packed an object is measured as mass/volume; Distribution: the number and kind of organisms in an area; Biomass: the combined mass of a sample of living organisms; Micronekton: free swimming small organisms; Zooplankton: small organisms that move with the current; Pacific flyway: a general area over and next to the Pacific ocean that some species of birds migrate along. Try this experiment to test sound waves. Get two bricks or two, 4 inch pieces of 2 x 4 wood blocks. Stand 50 ft opposite a classroom wall, and clap the boards together. Have others stand at the wall so they can see when you clap. Listen for an echo. Keep moving away and periodically clap again. At some distance, the sound of the clap will hit their ears after you actually finish clapping. With enough distance, the clap will actually be heard after your hands have been brought back out after coming together. Can you calculate the speed of the sound wave that you generated? Under what conditions might that speed be changed? Would weather conditions, which might change the amount of moisture in the air, change the speed? One oceanographic phenomena of interest is the deep scattering layer (DSL). This is a zooplankton and micronekton rich layer that is found below the depth that light penetrates to in the daytime. After sunset, this DSL layer migrates up closer to the surface. In some locations the daytime DSL may be at a depth of 225-250 m depth in this area of the California current ecosystem, and 0-100 m during the night. It is hypothesized that the organisms stay deeper down during the daytime to avoid predation, and move up toward the surface at night when it is safer from predators. Oceanographers take advantage of this information. Every evening, two hours after sunset, bongo nets are deployed to a depth of 200m and then slowly brought to the surface to get a sample of the entire water column. 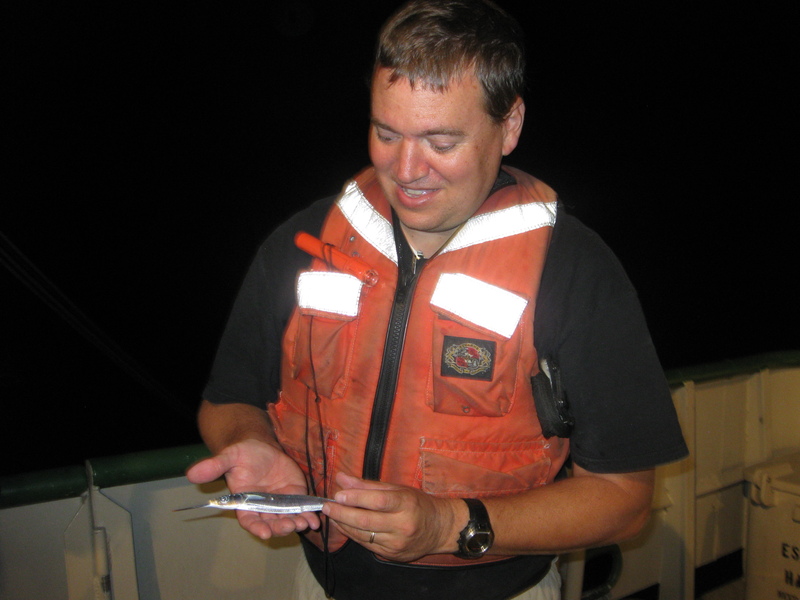 The purpose is to collect samples of those organisms that are found in the DSL. During the day these organisms would be much deeper down below the surface, but at night they are much closer. The process begins with opening up the large plankton nets and attaching a weight in between the loops of the frame. The frame is hooked to a cable that is maneuvered by a winch operator. After the bongo net is swung out from the ship, a large protractor, an inclinometer, is attached. This is used to give the Officer of the Deck (OOD) driving on the bridge an indication of speed needed to deploy the net at. 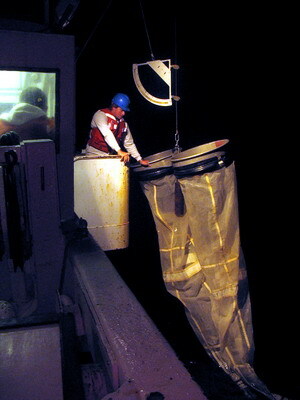 The OOD adjusts the speed of the ship to maintain the required angle, which allows the net to remain open for collection and reach the desired depth. 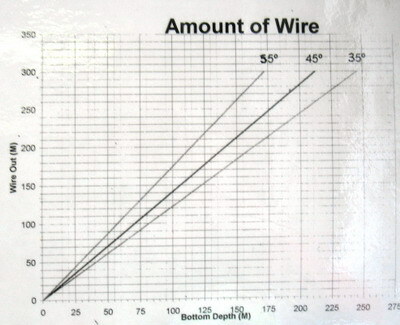 Looking at the chart above, you can see that the angle the wire is deployed at, along with the amount of wire paid out, can be converted to a given depth. Trigonometry at work. There is also a flow meter attached inside each of the bongo loops. The readings from this give an indication of the volume of water that passed through the nets. When the bongo is retrieved, before the end is detached, each net is rinsed with salt water from a hose in order to retrieve as much of the sample as possible in the cod end. This end is detached and brought into the lab. One of the samples is examined in the lab, for relative types, while the other sample is preserved in formaldehyde and sodium borate for later examination and identification. It is very interesting being rocked to sleep each night. 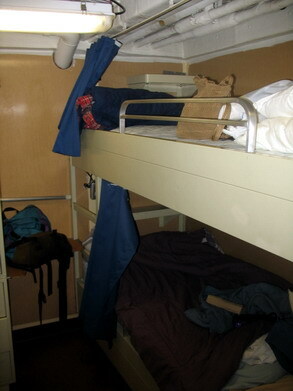 Being on the top bunk, I am about 2 feet from the ceiling, with several pipes suspended from the ceiling. Once settled in bed, there is little opportunity to move around much. But being slowly rocked from side to side is a very interesting sensation, and is relaxing. It is becoming easier to tell how calm the water is that the ship is moving through, or a little about the weather, since sometimes we rock up and down, instead of from side to side. We were told that when it gets really rough it is a good idea to place a life jacket under the edge of the mattress to keep us from falling out. Each bed has a dark curtain edging it, since many of the crew and scientists may have opposite shifts. 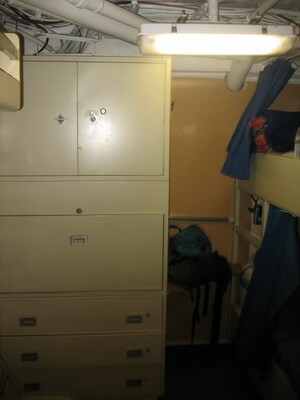 Since there is no porthole in my stateroom, when the lights are out and the curtain is closed, it is very dark. It would be impossible to tell night from day, except by an internal clock or a timepiece. It has been comfortable sleeping. Getting up is the only difficult part, maneuvering in the small space of the bunk and being careful not to disturb my bunkmate, Liz. Her schedule varies from mine, due to her bongo net responsibilities and CTD expertise. So far the sleeping arrangement has worked out well. Distribution: the local species and numbers of organisms in an area; Biomass: the combined mass of a sample of living organisms; Micronekton: free swimming small organisms; Zooplankton: small organisms that move with the current; Predation: the process of organisms eating other organisms to survive; Inclinometer: protractor designed to measure altitude from the horizon. What organisms do you know of that change their feeding strategy at different times of the day? In the local creek, river, or lake near you, are there both micronekton and zooplankton? How could you find out? This moon jelly was captured with the mid-water net. Its bell was 35.5 cm wide. The purplish pattern represents the gonads, which the turtles love to eat. The mid-water net was just deployed. This is a new net for the research team to use. On the trip north, during the first part of this cruise, the last net became mangled during use. A new, larger net was obtained and the crew is working out how best to deploy it. After three tries, they seem to have determined the best way to lay it out, release it, and winch it back in. The David Starr Jordan is now heading over to the off shore area outside of Point Reyes, where the plan will be to deploy it for only one to two minutes. The jellyfish there are usually so numerous that they will fill the net immediately. Leatherbacks eat jellyfish of many kinds, but they love the types in the Pelagiidae family. These are the types with long hanging arms, which the turtles snack on until they get up into the body cavity. The jellyfish are then eaten from the insides, with a soft-bodied bell left behind. The bell-shaped body of this family can be as large as 55 cm. The favorite of leatherback, so the one we will hope to find in abundance, is the Sea nettle, Chrysaora fuscescens. These are most numerous in August and September in specific locations off the California coast, so it can be anticipated that leatherbacks will also be found there. The predictability of this occurrence is the reason leatherbacks have evolved to travel the Pacific Ocean from Asia every year. Unidentified songbird, hopping a ride aboard the Jordan. The ship, David Starr Jordan, was built in 1965, so is among the oldest of the fleet of NOAA research ships. The age can be found in the cabinet design, the flooring material and little features. Never the less, it has been built for sustained trips at sea for up to 23 days in length. There is a steward on board who creates elaborate lunches and dinners daily. Last night’s dinner included Filet Mignon, shrimp in butter sauce, two soups, sautéed vegetables, and at least four other hot dishes. There is always a salad bar set up and 24-hour hot beverages, cereal, toast, ice cream, yogurts and fruit. Everyone eats well. In the crew’s lounge, drawers of over 200 current films are stored, including new releases. They have been converted to 8 mm tape to accommodate the video system on board. There is also a small gym with a treadmill, stationary bicycle and bow-flex machine. A laundry room completes the ‘home’ environment. At least three showers are available. The ship has a system to desalinate water, which is a slow process, so water conservation is suggested. This means: wet yourself down, turn off the water, soap up and scrub, then turn the water on and rinse off. Repeat if necessary. There are no water police, but we all have an interest in enough water being available. Although the food has looked great, I have found that until I get my ‘sea legs’ I need to stay away from most food. Yesterday evening, I discovered that the lunch and dinner I ate; did not look as good coming out as it did going down. Today is better, but I will stick to yogurt, oatmeal, and tea for a bit. What type of data is considered ‘oceanographic’ data? What types of organisms produce chlorophyll in the ocean? Deck crew setting up the mid-water net to be deployed off the back deck. 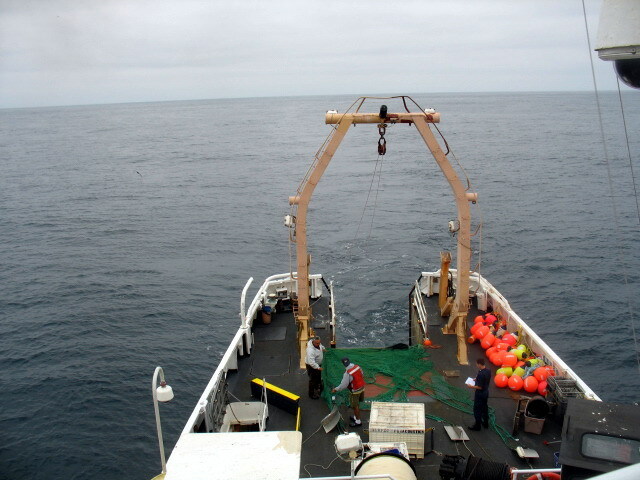 Two consistent methods of data collection on the survey include netting and collecting oceanographic data. Up to three times a day a mid-water net is carefully dropped off the back, and towed at the surface. The last two times the net has been pulled in one or two moon jellies have been caught. Each specimen is weighed and measured, then tossed back. Every evening, two hours after sunset, a bongo net is deployed off the side of the boat. With weights added, it is designed to drop as far as 300 m below the surface. 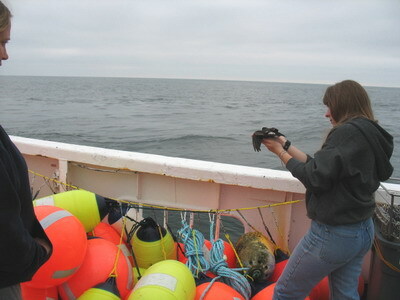 Since there are two nets collecting, the scientists are able to retrieve and preserve the contents of one, to be analyzed for species composition later, and examine the second here on the boat. This is done two hours after sunset since many organisms come much closer to the surface after dark, when their predators are less likely to find them. Another important tool that is used to collect oceanographic data is the CTD. 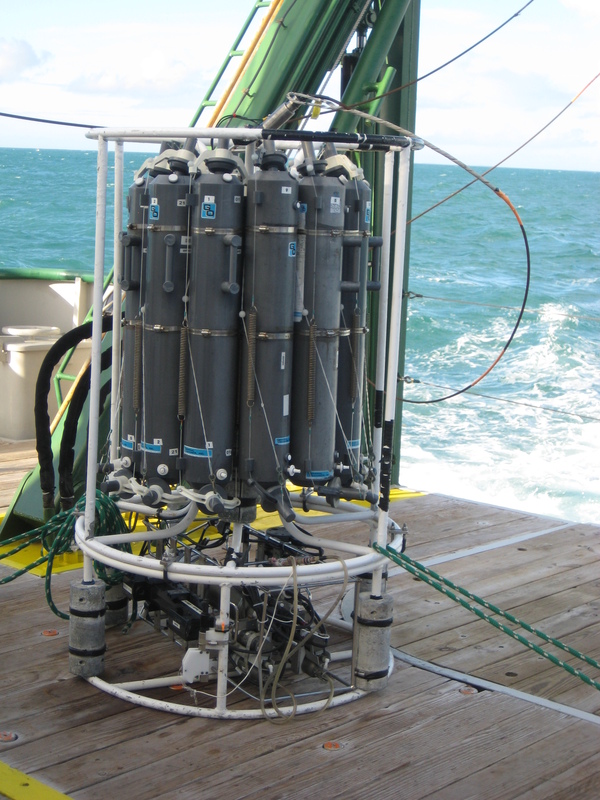 This CTD has eight chambers and can collect samples from eight different water depths. It is carefully dropped down to 500 m (or more if needed), and then a chamber is opened at intervals determined by the scientist collecting the samples. Every waking hour the temperature of the ocean is sampled using a XBT “gun” that shoots out a 760 meter long copper wire. XBT stands for Expendable Bathy thermograph. The weighted wire is kept in the ocean until a stable reading is obtained. This gives an indication of the temperature gradient from the surface down to 760 meters in the immediate area. 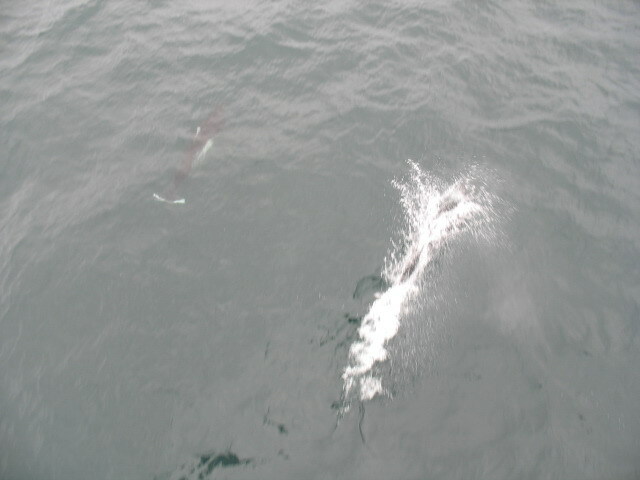 Two Dall’s porpoise gliding next to the ship. 180 of them! That was it for yesterday. The first afternoon, we saw one humpback whale spouting and then it showed its fluke as it went under. Another four were seen in the distance. We are all looking forward to more sightings. The primary job that I and another ship visitor have, is to act as observers up on the flying bridge, one half hour before the net is scheduled to be dropped, and stay until the net is retrieved. Because of the Marine Mammal Protection Act, all activity that could put these animals at risk must not be done if any marine mammals are in the area. So I sit up on the highest deck, and watch. There is a walkie-talkie next to me, a computer set to log any sightings of interest, including jellies that float by and high-powered binoculars to scan the surface. With snacks and beverages always handy in the mess hall, I can be quite cozy. What is the purpose of scientific names in international research? To become a marine scientist, what fields of science are required as background?